Leaving cardio out yesterday was helpful, my legs felt a bit more recovered, but still pretty tired. Cardio wasn’t helpful in regards to the legs either. I do think I will need to adjust my quad day volume. I trained quads 4 days ago and they are still sore, this is a red flag for me recovery wise on prep. Something to note on your end if recovery drops that much. Look at all other factors that can effect recovery before making quick decisions adjusting training. Sleep, supplementation, nutrition, and lifestyle can all effect, but remember somethings we can’t change due to fat loss goal’s. Weight was 0.2lbs up from yesterday, seemed about right. Today was my off day and a Sunday, which means a lot of computer time making plans. 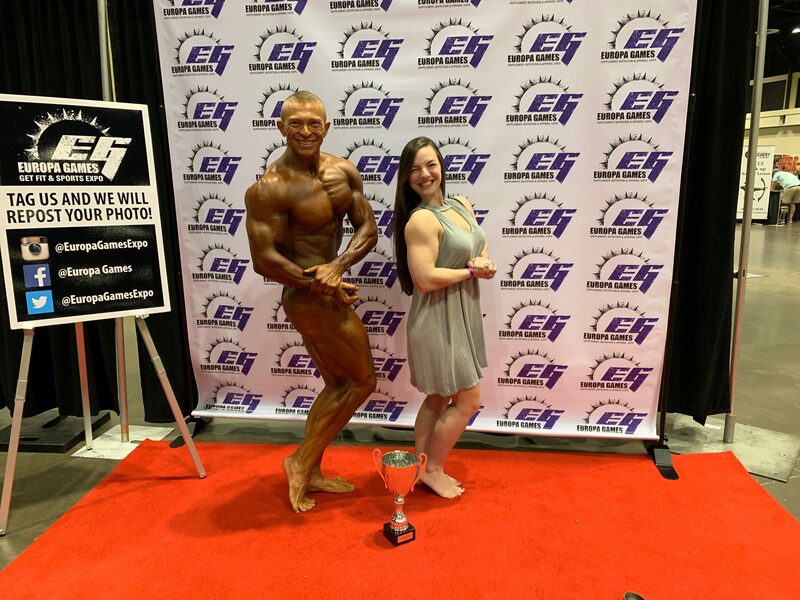 This whole weekend sleep was decreased from me peaking Luke Miller for the Orlando Europa (see pic above of Luke and his fiancé Emily). Its a two days show and time difference means I wake up really early, but not complaining at all, I was really excited about this peak. It was a special one for me cause he started working with me since his last show and 18 months later we moved him from Welterweights to a maxed out Light heavy. To watch him work and be able to see it all through was very rewarding. Just so thankful I pursued what I love to do and never settled. Anyway, sleep might have effecting recovery a little bit. Renee and I went to see Captain Marvel tonight, we both forgot Game of Throwns came out tonight too. I guess we will catch up this week. This whole evening I have had that sucked down feeling in my face, like tomorrow I am going to wake up really tight. I started weighing myself at night to track the water drop over night. Give me some data on fluid changes and expectations for the next day. Also for how much weight I put on during the day for weigh in considerations. Speaking of data, checked my BP this morning and it was 107/57. Never had an issue, but I like to monitor. I come from a family where high BP is in our genes, so I do take BP meds year around and monitor it closely when using androgens. High BP is a silent killer in society and really makes you wonder why some people (assisted or not) don’t monitor it! Do you monitor your blood glucose, mainly thinking in offseason where carbs are high. How is your fasted typically and what about about Hb1Ac? I don’t monitor blood glucose daily but I am thinking about this for offseason. My A1c 3 weeks ago was 4.7%, I have never had an issue with it either. Highest it ever was deep in offseason was 5.4%. Now if I could keep in 4.7% and go through offseason like that I think I would stay leaner and grow better.